Or you can pick up a good quality organic broth like the one I use in this video, from Walmart. 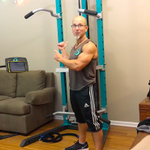 To post questions, comments or feedback about this training session, be sure to visit the Official SCULPTAFIT-Club private group zone and post in there. You already have the link bookmarked, or it is in the email that your originally received the day you became a member.